This plane was the only aircraft involved in a landing accident Friday at the Highland County Airport near Rocky Fork Lake. 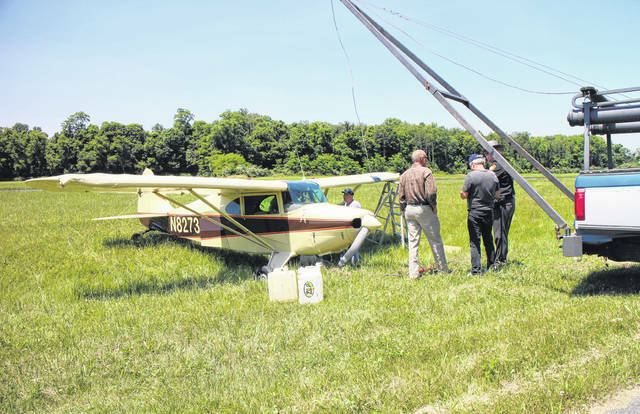 No one was injured Friday in an apparent landing accident at the Highland County Airport near Rocky Fork Lake. Darrell Larkin, an airport volunteer who witnessed the incident, said the aircraft landed smoothly, but when its tail wheel made contact with the runway, the plane made a sudden 90-degree turn and veered off the runway. Highland County Airport President Bob Jones said the plane sustained some damage and broke a runway light. Jones said it was too soon to speculate what caused the incident. “At this point, nobody knows,” he said. Jones said there was only one occupant in the plane. He declined to release the name of the pilot. Highland County Sheriff Donnie Barrera responded to the scene, and the Ohio State Highway Patrol arrived later to investigate the incident.